Ebony and Ivory, the juxtaposition of black and white always captures the imagination. The white and black can describe polar opposites in good vs. bad, light vs. dark, the absence of color vs. it's darkest expression. We know that it has inspired music, like Paul McCartney and Stevie Wonder's "Ebony and Ivory" that pleads for understanding across racial lines. On the lighter side, it's the name of a variety of crape myrtle bush,and when I spent too much time Googling the phrase, I came up with a novel based on Celtic lore with that title. Ebony wood comes in varying shades, and the pure black is prized. It's exceedingly dense, so dense that it won't float in water! 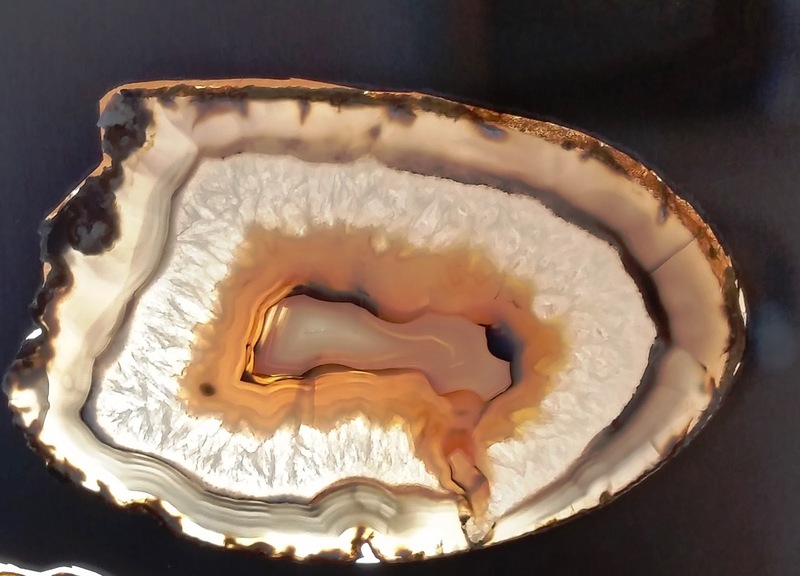 From a lapidary standpoint, that denseness means it will take a superb polish. Elephant ivory is extremely difficult to get legally, and probably best not pursued. On the other hand,you can legally get ivory from walrus tusks, or the two front teeth of elk that are believed to have been tusks in ancient history. 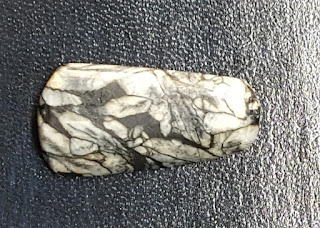 If you want to do some ivory cabochons that will really gross people out, wart hog tucks are ivory too. So for this blog post, I'll just use minerals that give that Ebony & Ivory feeling, without a spec of either one in their make-up. For my money, snowflake obsidian makes a wonderful ebony and ivory match,although, black obsidian is actually very, very, very dark brown. Chip a tiny bit off and hold it up to a bright light, you'll see! There are also lighter brown obsidians, but that's for a future blog. 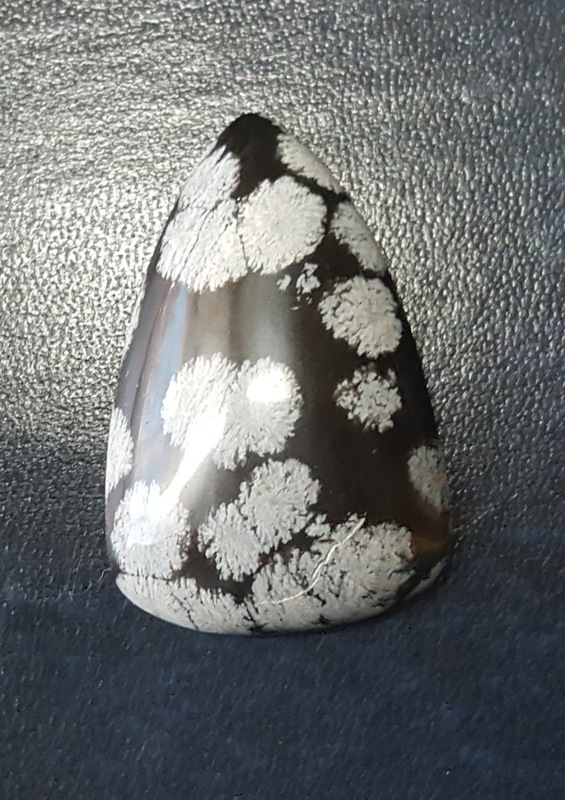 The "snowflakes" in the obsidian are actually cristobalite. As you know, obsidian is igneous (volcanic stone) and has no crystals. It is primarily made of silicon dioxide (Sio2) with other minerals, However but when some of it cooled , bits of pure silica formed crystals leaving these fascinating inclusions. Perhaps the closest to ebony and ivory is this free-form slab of dendritic opal. 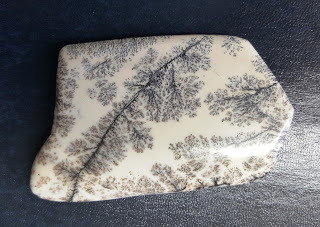 The white here is the creamy white of old ivory piano keys and the black dendrites remind me of the growth of trees--like ebony. And yes, if you're wondering, these stones have not only been talking to this Lapidary Whisperer , they won't shut up! I couldn't resist putting a pinolith cab in this blog post. It's a real favorite to work with. The shapes tell all sorts of wonderful stories. If you want to know more about this fascinating stone, check out my blog post on it. 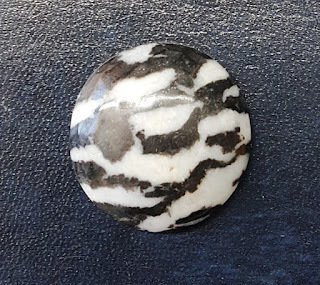 This round black and white jasper is called zebra jasper, which gets us back a bit to the animal kingdom from a previous blog, but it's not animal, it's just a cool-patterned jasper. In my experience, it takes a really nice polish and gets a lot of "oohs and aaahs" when I show it off. I wish I knew where the slab I made this cab of came from. It's defined by the squiggly lines that look almost like scrimshaw. 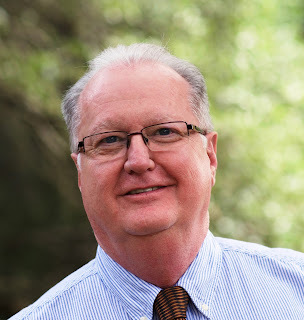 I'll be back in two weeks with some new musings by this Lapidary Whisperer. When I think of rocks for my lapidary projects, I tend to think of minerals in their natural state. 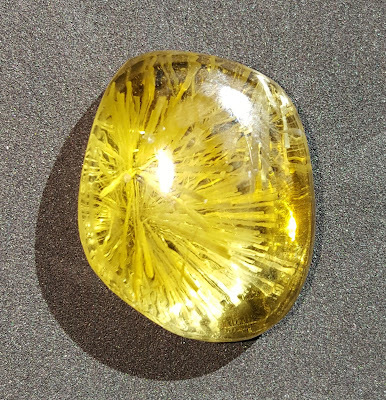 When I think of lab-created mineral products, I think of gemstones like sapphire or diamond. But there is actually a third category that falls roughly between the two. The truly unnatural cab materials. 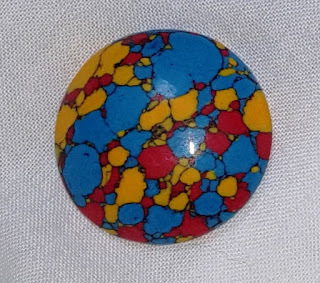 I made this incredible free-form cabochon using material I purchased from Ray. 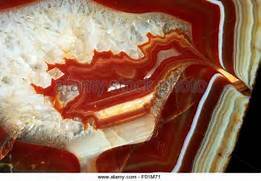 He makes it by melting quartz and other materials to 2300 degrees Fahrenheit and letting the cool slowly over a period of weeks. As it cools, crystals bloom inside the new slab. 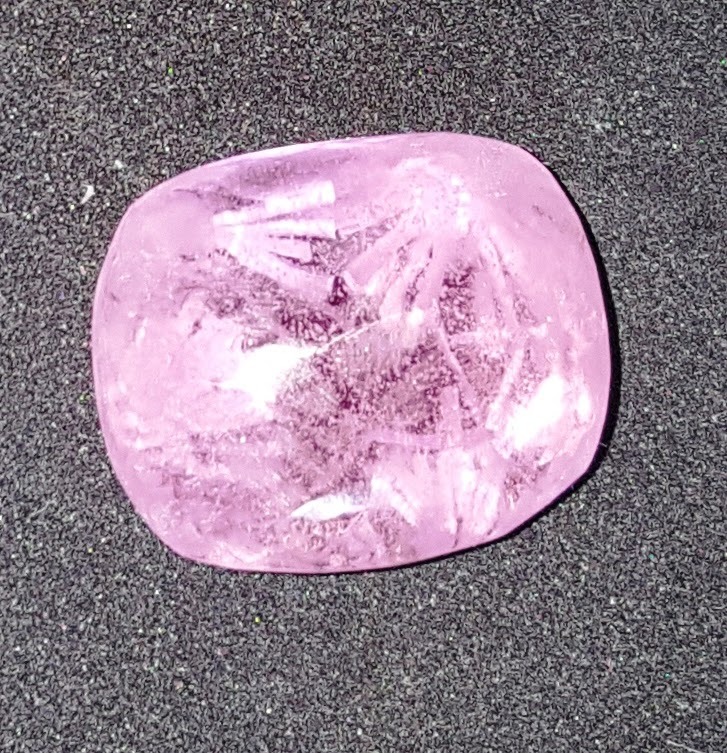 This pink cabochon is made of the same basic material and as you can see the spikes are thicker and there is almost microscopic sparkling dots adding a completely different look to the finished cab. to see what he has available now. Slag glass is a fascinating mix of manufactured (the glass) and the artistic patterns that are formed when it is dumped into a heap. 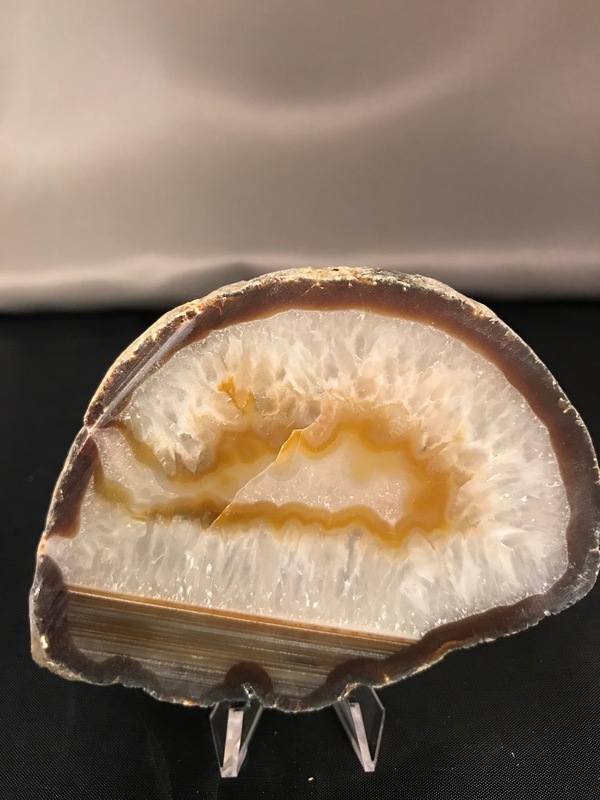 It's not so much a cold-blooded product like goldstone (see below), but a happy combination of the way the different colors are disposed of into a glass slag heap. For me, this comes right under Roy's crystals because while it is pretty and shiny, it lacks the gemmy look of the other. Slag glass is excess material from the glass making process. 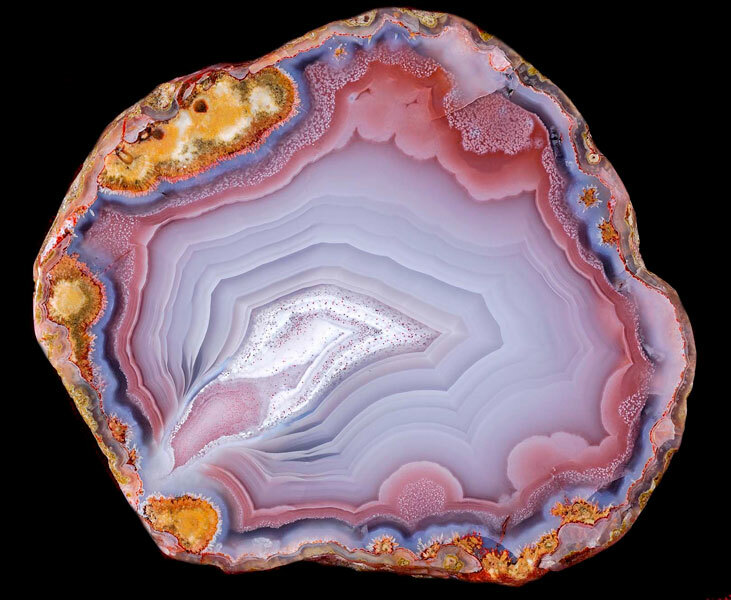 It is often cast aside as undesirable--unless of course, you love committing lapidary on it. I found this yummy piece as a random slab at a rock show. I loved the movement it contained and decided to take it home and let it tell its story. 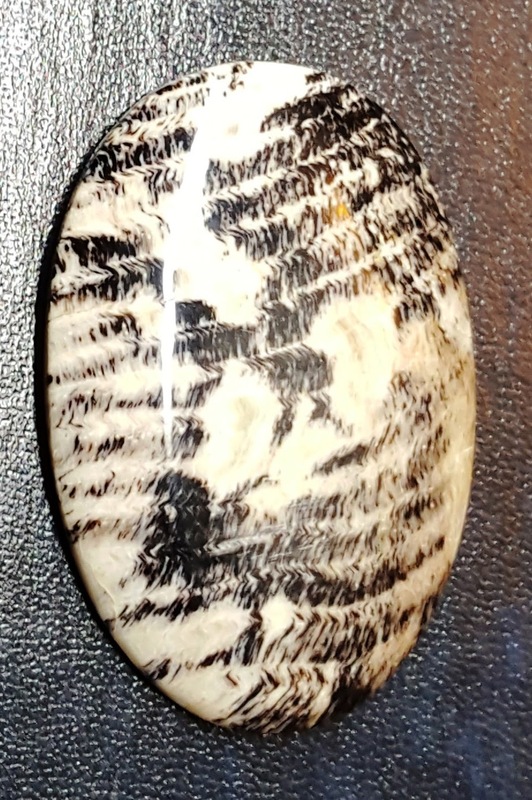 You can clearly see some aspects of the rock supporting the cabochon through the transparent sections. You know when something is too good to be true . . . but it isn't? 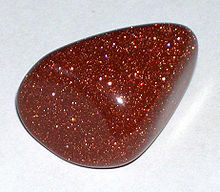 Goldstone is often found at rockshows and in jewelry. I've been told at various times that it was mined in Russia or South America and that the flecks were real gold. Great story; but not true. If a seller tells you this, assume anything else they tell you about their merchandise is equally untrue. However, it can also be truthfully called adventurine glass, stellaria, or monkstone. It comes in two steps below Ray's crystals because of its uniform consistency. Ever notice the difference between a natural granite slab countertop and a manufactured one? The natural one will generally have inconsistencies that pull your eye around the surface. The uniformity of the manufactured ones is lovely to look at, but without the inherent charm of the natural. Goldstone is a glass product made in a low-oxygen environment. According to Wikipedia, "The most common form of goldstone is reddish-brown, containing tiny crystals of metallic copper that require special conditions to form properly. The initial batch is melted together from silica, copper oxide, and other metal oxides to chemically reduce the copper ions to elemental copper. The vat is then sealed off from the air and maintained within a narrow temperature range, keeping the glass hot enough to remain liquid while allowing metallic crystals to precipitate from solution without melting or oxidizing. "After a suitable crystallization period, the entire batch is cooled to a single solid mass, which is then broken out of the vat for selection and shaping. The final appearance of each batch is highly variable and heterogenous. 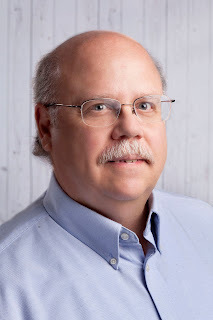 The best material is near the center or "heart" of the mass, ideally with large, bright metal crystals suspended in a semitransparent glass matrix." As you know, most Fordite is a single color with swirls showing the way the material settled and hardened. Sometimes it's called Motor Agate because it is made by layers and layers of automobile paint that was sprayed at cars and has hardened to a product that can be cut and polished into cabochons. This comes in last of the four lapidary materials covered in this blog post. It just doesn't have the pizazz of the others and isn't as likely to talk to me about what it wants to be as the others. When I was in Quaratzsite last year, I saw one block of Fordite that really caught my eye. It consisted of the primary colors of red, blue and yellow. It was so cheerful that I just couldn't resist. It's fun to work with and makes beautiful slabs and cabs (doesn't this one look almost like a button for a child's outfit?). But if you get some, be careful not to work it with too rough a grit. If I used anything rougher than a 220 grit on my wheel, the little bits of color had a tendency to fly off. I'd love to hear about any unnatural materials you use for cabbing. Drop me a note!